What makes an insect an insect? What makes a bug a bug? Read and find out! 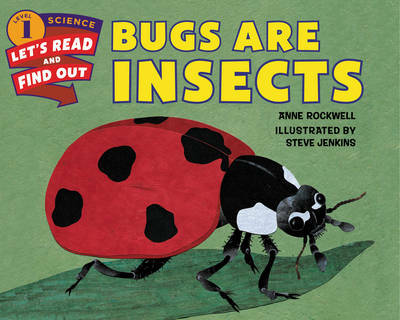 With intricate and vividly colored collages from Caldecott Medal winner Steve Jenkins and engaging text from Anne Rockwell, Bugs Are Insects introduces the youngest readers to the fascinating world of the creepy crawly. Now rebranded with a new cover look, this NSTA/CBC Outstanding Science Trade Book includes activities such as conducting an insect survey, drawing a picture of your favorite insects, and planting a butterfly garden. Both text and artwork were vetted for accuracy by Dr. Ed Spevak, Curator of Invertebrates and Director of the Saint Louis Zoo WildCare Institute Center for Native Pollinator Conservation. This is a Level 1 Let's-Read-and-Find-Out, which means the book explores introductory concepts for children in the primary grades and supports the Common Core Learning Standards and Next Generation Science Standards. Let's-Read-and-Find-Out is the winner of the American Association for the Advancement of Science/Subaru Science Books & Films Prize for Outstanding Science Series. My First Zoo Let's Meet the Animals!